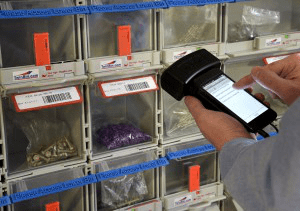 Inventory control just reached a whole new level with our Twinbin RFID KanBan Systems! Utilising clever materials to act as RFID shields, you can now incorporate passive Radio Frequency Identification (RFID) tags into all your Hurst Green Plastics products. Turning all your KanBan Systems into automatic Twinbin RFID KanBan Systems. RFID is an automatic identification method, relying on storing and remotely retrieving data using RFID tags. Unlike more conventional scanning systems, the tags do not require a line of sight or need to be individually scanned. TwinBin RFID work the same as normal TwinBins however when the slider is pulled, the RFID tag is exposed, automatically sending a signal that replenishment is required. This means the bins no longer have to be physically examined. The RFID Reader is available in two formats, Fixed or Portable. Fixed Readers are fitted above the rack and take a constant reading, this means you get minute by the minute updates on stock levels. Portable Readers require a staff member to scan the rack as and when required. 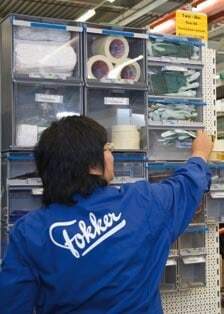 However, unlike traditional barcode scanning the worker only needs to walk past the rack to get the information needed.